Suliman (Suli) Jamal is a Long Beach personal injury attorney and founder of Jamal Injury Law P.C. Mr. Jamal has been selected as Top 40 Under 40, by The National Trial Lawyers and as a Super Lawyers Rising Star. Mr. Jamal exclusively represents individuals and families injured in accidents throughout California. As an injury lawyer, Mr. Jamal handles the following types of cases: car accidents, motorcycle accidents, truck accidents, pedestrian accidents, bicycle accidents, slip n fall accidents, medical malpractice and pharmacist malpractice. More generally, if an individual or family is injured because of the negligence, recklessness or intentional conduct of a third-party, Mr. Jamal can likely help. Prior to establishing Jamal Injury Law P.C., Mr. Jamal gained extensive litigation experience while he served as a judicial extern to the Honorable David O. Carter in the United States District Court for the Central District of California. As an extern, Mr. Jamal was exposed to the inner-workings of the litigation process and obtained first-hand knowledge on how the Federal Courts handle civil cases. He also worked as an attorney for a prominent law firm in Irvine, California. In this position, he represented all types of businesses in various litigation matters. Although he found his time representing big corporations while working for a big law firm to be challenging, his ultimate goal was always to represent the victims of personal injury accidents. 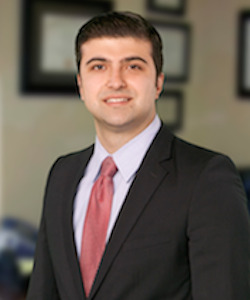 After obtaining extensive litigation experience, Mr. Jamal decided to follow his dream and start his practice. Mr. Jamal graduated in the top 5% of his law school class at Chapman University Dale E. Fowler School of Law. During law school, Mr. Jamal was an Articles Editor for the Chapman Law Review and a member of the Mock Trial Honor Board. Mr. Jamal was also an academic fellow and a student ambassador. Mr. Jamal’s desire to help the people in his community was the main reason why he founded Jamal Injury Law P.C.. Growing up, his community did a lot for him and his long life goal had always been to give back. Being able to fight for the rights of injured accident victims throughout his community makes his job very rewarding. When not fighting for his clients, Mr. Jamal enjoys playing basketball and spending time with his family. The competitive drive he established while playing sports growing up has stayed with him throughout his career and helps drive him each day.